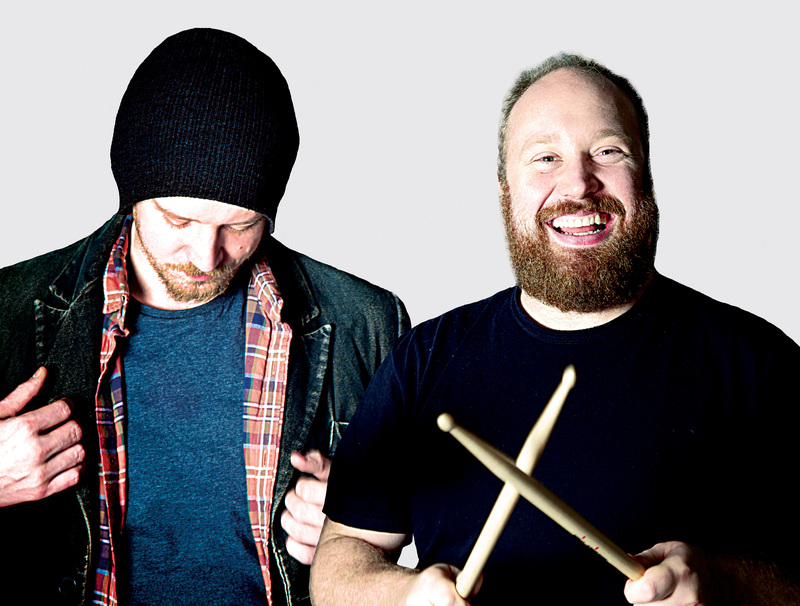 One such show is the latest hour from Jonny & The Baptists: the musical satirists who we’ve long since dubbed Honorary Onions. 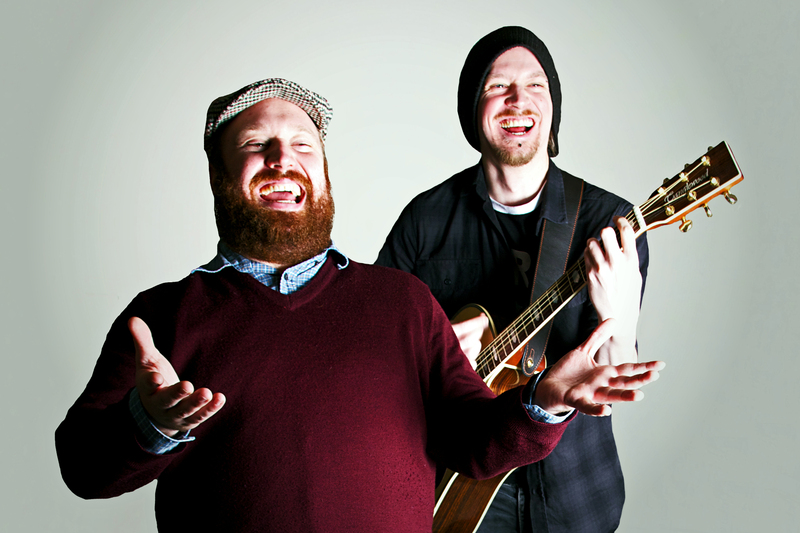 Frequently sharing the bill with many of the acts we cover on these pages, as well as touring the UK steadily over the last few years, the duo have gained a cult following with their politically charged songs and the occasional bout of cheeky madness. Hi gents, thanks for catching up with us. Are you excited to be back in Edinburgh? Absolutely. Edinburgh is one of the greatest cities on earth, and being back at the Fringe is a bit like putting on your favourite hat: it’s familiar, it smells nice, all of your friends are there and it has a healthy attitude towards the arts. On second thoughts, a hat is a terrible analogy. Your latest show is called Eat the Poor. What can you tell us about it? Eat The Poor is all about inequality, homelessness and the wealth gap. Britain has now been getting steadily more unequal for 37 years and it is breaking our society apart piece by piece, so we’ve spent a whole year travelling round the country researching why we’ve let it get this far. Also there are songs and jokes. And swans. There’s lots of new songs too. What can we expect to hear this time around? This is our most narrative-driven show to date, so we’ve tried to cram in a balance of storytelling songs, rabble-rousers and (for reasons that will become clear during the show) some slightly more ‘musical theatre-y’ ones. Of course you can also expect some big silly ones that may be more akin to our previous shows (I’m looking at you again, swans) but we’ve tried to push the boat out be more musically ambitious this year. We’re hugely excited to see what people think! Musical comedy often pushes political buttons. What drew you both to expressing yourselves in this way? I think there’s something about music that can grab people, be it from protest singers or comedians or just good ol’ fashioned bands. Music is a medium which (quite literally) people listen to. Given the chaotic nature of the last few months, has it been harder to write a topical show because everything was changing so fast, or easier, because it made you reach for more universal truths? A little of each really. People often say ‘Wow there’s so much going on at the moment! I bet you don’t even have to write material’ – which we suppose makes sense. There is a minefield of topics to draw from and perhaps it has made us try and write more about the roots of societal problems as opposed to the results, but at the end of the day we’d much rather live in a safe, functioning world and have absolutely nothing to write about. Then we could all just be happy and play table-tennis. A lot of comedians haven’t really drawn on the current climate for humour yet: they’re just angry and more politically charged than ever… presumably like the rest of us! Yet what I’ve found in the past is that, when I’ve struggled to put across a point intelligently and get people to engage with it, it’s often comedy that elicits a response. Do you feel the genre, particularly musical comedy like yours, helps audiences get a grasp on their emotional and intellectual response? Very much so. People are more receptive to considering ideas when they can laugh about it or tap their foot to it. If someone likes your joke and has a bit of a giggle, they may well think a bit harder about where that joke comes from or if they agree with it. The same applies to songs – if you can enjoy it both on a musical level and an ideological level then you’re on to a winner, but even if you only emote with one of those things it definitely opens you up to the other. Life is more manageable with humour, and so are opinions. In your last show, you discussed writing a letter to Matthew Hancock after he infamously dismissed climate change. He’s now been made Minister for Culture. Scared yet? Don’t even start. It’s a bad omen for things to come isn’t it. ‘Minister of State for Culture, Communications and Creative Industries’ is an important post, and we might as well have given it to an egg. TVO has seen you live many times now, and what always strikes me is that your shows are honed to perfection but still maintain an edge where absolutely anything could happen. Are you happy to go off the beaten track for the sake of laughs? Utterly happy to. We’re genuinely best friends, so getting to be on stage together is a constant delight, and because a lot of the songs are ‘locked down’ we try to keep each other on our toes for all the other bits. If we can make each other laugh then that’s lovely, if an audience enjoy that then it’s joyous. I think it can be easy to get sick of shows if they’re totally nailed down – we just try to stave that off for as long as possible. Also we often forget lines, so sometimes it isn’t…erm…by choice. There’s a wonderful chemistry between the two of you that’s really quite infectious. How did you start working together initially, and what do you each think draws you to the other? We’ve sort of known each other for about 15 years, but six years ago we met properly at a wedding. We got hammered and ended up getting tickets to see Pulp the next week. Then we went there, got hammered again and did that whole ‘Hey you, you know what we should do? We should start a BAND – wouldn’t that be great? You and me, BAND FRIENDS’ etc. and a few days later we actually went through with it. We just sort of hit it off and immediately trusted each other, dropping everything else to try and make this work and it’s brilliant. 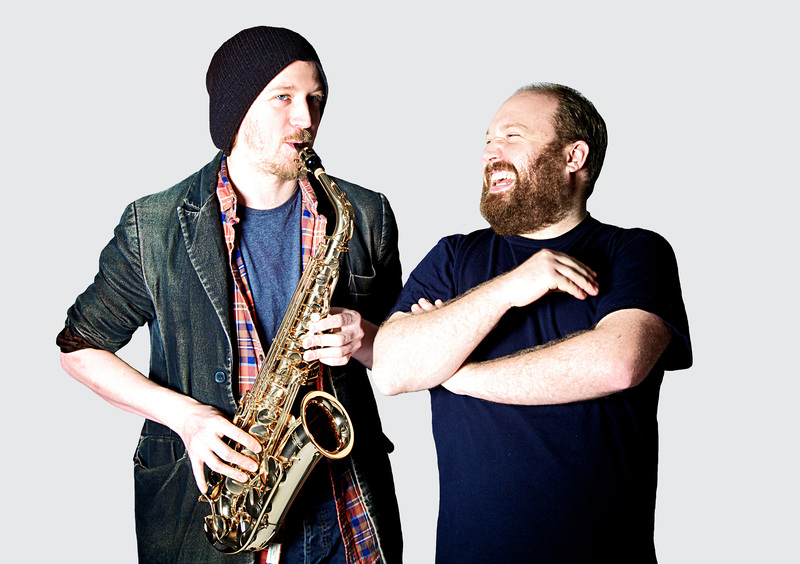 We each get to work with our best mate and then when we write comedy about our friendship it comes from honesty. Also we’re both big fans of pool. And darts. And drinks. Oh hang on we’re both just big fans of pubs. This is far from your first Fringe. Do you feel like veterans yet? Veterans sounds a bit glamorous for two tools with guitars. We just like spending our summers singing funny songs to people and telling weird stories together. As long as Edinburgh will continue to have us, we’ll keep coming and maybe one day ‘veterans’ will fit the bill. But for now we’re more like the problem locals at a very, very large pop-up bar. Have you got any survival tips for Edinburgh? See your friends. Yes, see their shows, but also just spend time with each other. It’s so easy to get wrapped up in everything that you forget to enjoy yourself and that’s the recipe for disaster. Other tips include always asking for salt ‘n’ sauce on your chips, trying not to chain smoke, and remembering there is a hospital for when it all goes wrong (we’ve been there a lot – it’s a damn good hospital). A whole host of stuff actually. It would be impossible to name them all, but we’re particularly looking forward to Bridget Christie, John-Luke Roberts, Josie Long, Nish Kumar, Rachel Parris, Ria Lina, Colin Hoult, Thom Tuck, Stewart Lee…the list goes on. Outside of comedy though we’re going to be trying to see a lot of theatre at Summerhall – their programme this year is exceptional. Naturally, we’re coming to see you. So the all-important question: What’s your tipple? How extraordinarily kind! Jonny’s a Tennents, Paddy’s a Guinness, and we expect to know yours in return. Finally then. We have a long running question we ask most people at some point, and given your previous stance on categorisation of these establishments, this could be interesting. If you were a pub, what would you be called and what kind of pub would you be? Our pub will be called ‘The Questionable Phoenix’, with the motto ‘We think he’s just a pigeon’. It will sell real drinks (none of this craft nonsense), be dimly lit, have plenty of pool tables & dart boards, a decent beer garden and two clumsy landlords. Everyone’s welcome – especially dogs. Jonny & The Baptists, thank you. 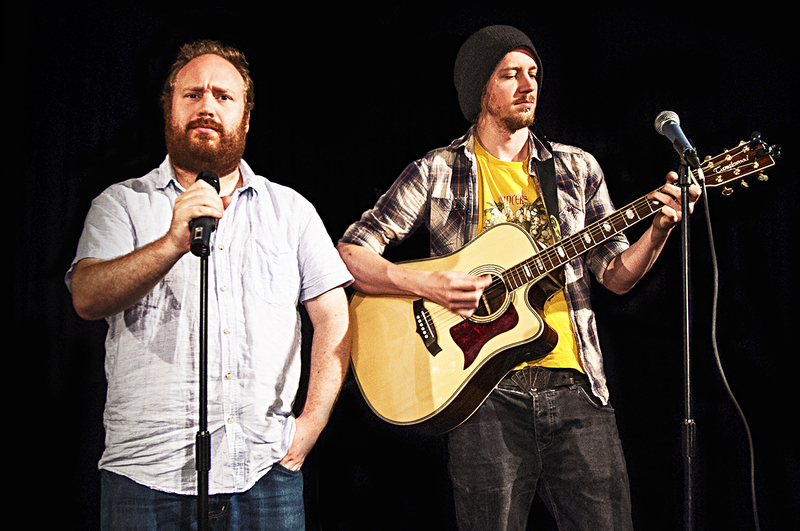 Jonny & The Baptists: Eat the Poor is at Summerhall until August 28th (except 16th and 23rd). Non-edible tickets are available over yonder. You can also listen to their 2015 album The End is Nigh below, and buy audio cds and downloads from Bandcamp.